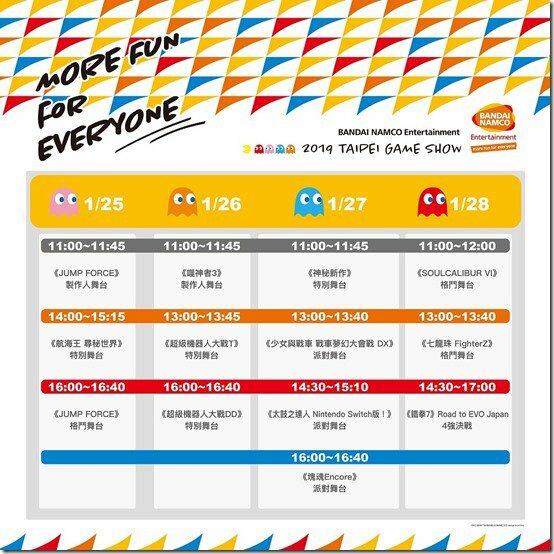 Bandai Namco is heading to the Taipei Game Show 2019, and they're going to have all kinds of demos, stage shows and more. The show itself kicks off Jan. 25th, 2019, and Bandai Namco is bringing Jump Force, One Piece: World Seeker, Super Robot Wars T, Super Robot Wars DD, God Eater 3, Girls und Panzer: Dream Tank Match DX, Taiko no Tatsujin: Drum n’ Fun, Katamari Damacy Encore, SoulCalibur IV, and Dragon Ball FighterZ with them. That's not all there is, though. Bandai Namco is also teasing a mystery game for the event. They'll be showcasing that game on January 27th, 2019 from 11am to 11:45am Taiwan Time (UTC+8).